Managing the products of the company is one of the most important and valuable duties in the organization. Proper management of this field, allows to follow and control the products mix, production process, costs, pricing, campaigns etc. The Product Design Module of Hyper is a simple and effective tool for creating products cards, which will be available for the users while creating new orders, sales and price offers. This module is used for creating and adding new products to the organization's products list and also allows to modify and edit the exist products. This module gathers all of the organization's products and services, and displays every required and defined detail, for each product: products description, measures and scale, costs and selling prices, product configuration, campaigns, suppliers, products catalog etc. Products - This tab is used for creating and adding new products, searching for products and allows the user to modify and edit product card, render product configuration, update suppliers and costs, create campaigns and print barcode labels. For further information please read the next section of this page. Virtual Menu / Field Value List - The virtual menu is used for organizing and sorting the products and services, by using custom criteria, folders and menu. The menu is also used for creating the products catalog. For further information, please Click here. Test Product Rendering - This tool was designed for creating a demo order to verify and validate its details and simulate it. For further information, please Click here. This is the primary tab of the Product Design Module. This tab is used for for creating and adding new products, searching for products and allows the user to modify and edit product card, render product configuration, update suppliers and costs, create campaigns and print barcode labels. These actions are described below. The primary tab displays the products search tools and the results table that displays the required products cards for view and for updating the product details (according to authorizations). After searching for the required products, the action buttons at the top of this tab will become available. Additional information fields will be displayed at the bottom of this tab, according to the users need and requirements. At the search field, fill in one of the products identifying details (Catalogic Number / Group / Product Name) and press the Search button. Alternatively, use the Search Wizard button, to create customized filters for the search. The results table will display the required products list. Press a product record to view additional information fields at the bottom of the table. Double click a selected product to open its product card. Print Barcode labels for selected products. This button displays the "Print Barcode Labels" window, with the list of the organizations items, and allows to select the required label format for the printing. The labels format settings are also available from this window. For further information about the Barcode Labels Wizard, press here. Modify the selling price, to the selected percent of the current price. This option also allows to use the cost price multiplier, as was defined in the product card. Create a new campaign for the selected product. This option allows to create the campaign for all of the organization's clients or only for selected customer club clients. In order to create the new campaign, select the required product record and press this button. In the "New Campaign" window, fill in the following fields: Campaign Name, Discount %, Valid From / Till Date, Valid From / Till Hour, Available for Customer Clubs. Product Card - This tab is used for defining the product as well as its measures, scale, selling price, inventory requirements etc. 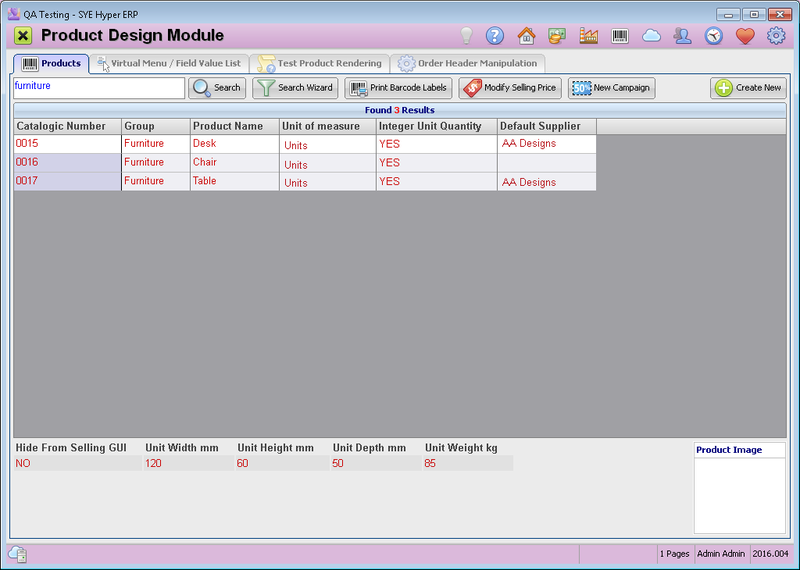 Render Product Configuration - Create and edit product trees, for products that require assemble of other items and parts. Suppliers - The list of available suppliers for this product. Sale / Campaign - Create a campaign for the selected product.